It was a ground breaking, historical, exciting morning at the Skyline Church in La Mesa. For the first time the Skyline Church opened its doors and merged with the Tree Of Life Messianic Jewish Congregation which had its own church in Spring Valley. The morning started with a breakfast. Then off to the worship auditorium on the fourth floor that overflowed with a mixture of both congregations. Rabbi Joel Liberman welcomed and thanked everyone for being there on that historical occasion. 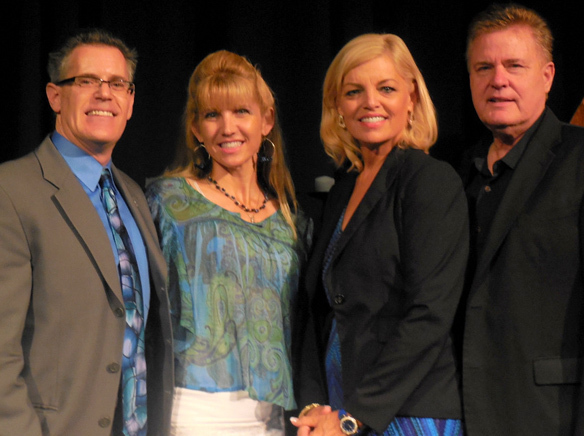 Lead Pastor Jim Garlow and his wife Rosemary welcomed the new congregation into Skyline. There was music, laughter, and even dancing to the Israeli music being played upon the stage. For the very first time, the Torah was walked around the worship auditorium and was touched and kissed by all. It is made out of parchment and is one scroll with two handles which act as rollers for the one scroll. It is hand printed in Hebrew. The Torah contains the Five Books of Moses that include the biblical books of Genesis, Exodus, Leviticus, Numbers, and Deuteronomy. Skyline Church and the Tree of Life Messianic Jewish Congregation became one. The idea of merging the two churches into one actually came about on Pastor Jim and Rosemary’s wedding day. That is the day Liberman met Garlow for the first time and exchanged dialogue about this possibility. “What is happening here today will be happening in other churches across the country,” said Jim Garlow. Rabbi Joel Liberman led the mixed congregation in prayer and song. After the service was over lunch was served. It was a memorable occasion of which the hundreds of people in the worship auditorium felt the need to unite the Jewish and Christian community and to heal the rift between religions. Messianic Jews are Jewish people who believe in Jesus as the Messiah. Jewish traditions are still observed. The Old Testament and the New Testament are practiced. There are approximately 100,000 Messianic Jews in the world and growing. While being in Skyline Church the Messianic traditions will still be observed. Cathy Lasota from Skyline Church said it was a great day for the future of combined religion in East County. Mary Sullivan from the Tree of Life Messianic Jewish congregation said, “Absolutely wonderful, a beginning to unite us into one. The Tree of Life Messianic Jewish Congregation will be meeting on Saturday mornings in the worship auditorium on the fourth floor.